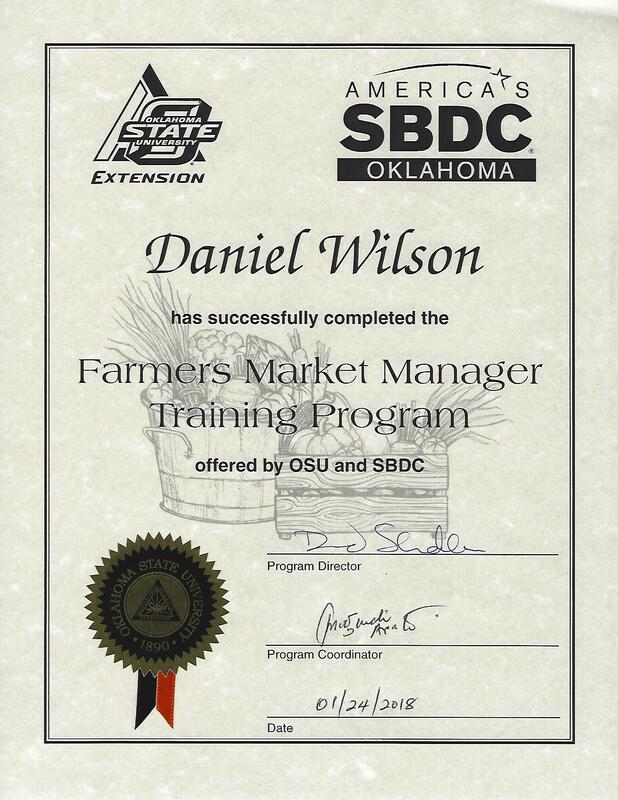 I thoroughly enjoyed taking the Farmers Market Managers Training Program that OSU Extension and the Oklahoma SBDC created for us. We were given a ton of information and I learned a great deal from all of the knowledgeable presenters. I’m am glad that I was able to participate in first class ever offered in Oklahoma. I hope that I can take everything that I learned and apply that knowledge to the Pittsburg County Farmers Market so that we can once again have a thriving market in McAlester. The Farmers Market Board is already looking at new ways to bring in new vendors and new ways to advertise our market so that we can spread the word that our market is growing. The ONIE Project (Oklahoma Nutrition Information and Education Project) made some calendars and recipe cards available to us so that we can distribute them to the market vendors. That way the market vendors can pass them out to customers as they come through. The ONIE Project has been very helpful with helping us begin the process of obtaining an EBT machine that our whole farmers market can use. Even if we are not able to obtain an EBT machine for the whole market this year, remember that The Farm LLC can still accept SNAP customers. We hope to see you soon at the Pittsburg County Farmer’s Market in McAlester Oklahoma this spring. I loved your talk, thank you! Oh yah, I can’t seem to find a link to sign up for your blog. Am I missing it somewhere?